Minstrelsy has a rather long and convoluted history, its origin with a singing group of white men from Virginia – the Virginia Minstrels – who in the innocent days of 1843 decided to darken their faces with cork as they put on a banjo show at New York’s Bowery Amphitheatre, in a fad that in various forms went on well into the twentieth century. More recently, the tables were turned, as in the Wayans’ brother’s 2004 outing White Chicks, blacks not only played whites – with more advanced technological make-up and latex – but, as the title suggests, white women. The latter premise seems to have fizzled far more quickly, and the film garnered a 15% on Rotten Tomatoes. Offence and scandal are sensitive things, dependent upon culture, relationship, intention and other mysterious factors. A few years ago at the College where I teach, we put on The Lost Elevator by Percival Wilde, in which the drama takes place in one of those old, crowded elevators – the operator of which was supposed to be in ‘blackface’. We did one performance, and the backlash was swift – from certain members of the wider community who may not have been so strict on other moral values. The thing is, in the play, besides the attempt at humour, the black-faced character ironically ended up being the wisest member of the group, a resolving deus ex machina, signifying in an ironic way that those formerly discriminated against – people of colour – had gifts that so many failed to realize. The point was lost when the white actor was, well, just white. There may well be other ways to make such points in our culture than minstrelsy, even of an ironic variety, but we should ponder our priorities. As readers are now all too aware – or is that woke? 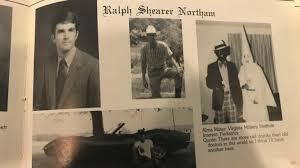 – Dr. Ralph Northam, current Governor of Virginia, has been vilified a year book photo in which he seems to be dressed as a minstrel; this, he denies, but does has apparently admitted to wearing a bit of blackface – some ‘shoe polish’ rubbed on his cheeks – at some vague point in his life, so that, as he says, he could mimic Michael Jackson doing the moonwalk; I will leave the reader to imagine how much shoe polish was needed for the ever-paler-visaged crooner. The infant would be delivered. The infant would be kept comfortable. The infant would be resuscitated if that’s what the mother and the family desired, and then a discussion would ensure between the physician and the mother. As Father Rutler ominously puts it, Northam prudently did not add what the ‘discussion’ would be about. The Catechism teaches (par. 1860) that no one is deemed ignorant of the principles of the moral law, to say nothing of the basic tenet of the medical art in which Northam has a degree, to first do no harm. And one might think that harming defenceless children is at a very principled level deeply against the natural law. Yet things are even worse than I thought, as the academic-media complex ignores the real evil here. Wesley Smythe’s description of the intellectual ‘elite’ justifying the murder of infants is eye-opening even for this inured soul. I had no idea there was such a thing as the Groningen Protocol, listing the requirements – as they euphemistically put it – for ‘euthanasia in newborns’. Read it and weep. To paraphrase Chesterton, the neo-barbarians will be wearing labcoats and neckties. I know not the guilt of such men as Dr. Northam and his ilk – and we all carry some burden for the culture of death – but whatever one thinks of blackface, it’s nowhere near as bad as a black soul.